Classic data warehouse architectures are made up of a chain of databases. This chain consists of numerous databases, such as the staging area, the central data warehouse and several datamarts, and countless ETL programs needed to pump data through the chain. This architecture has served many organizations well. But is it still adequate for all the new user requirements and can new technology be used optimally for data analysis and storage? Integrating self-service BI products with this architecture is not easy and certainly not if users want to access the source systems. Delivering 100% up-to-date data to support operational BI is difficult to implement. And how do we embed new storage technologies, such as Hadoop and NoSQL, into the architecture? It is time to migrate gradually to a more flexible architecture in which new data sources can hooked up to the data warehouse more quickly, in which self-service BI can be supported correctly, in which OBI is easy to implement, in which the adoption of new technology, such as Hadoop and NoSQL, is easy, and in which the processing of big data is not a technological revolution, but an evolution. 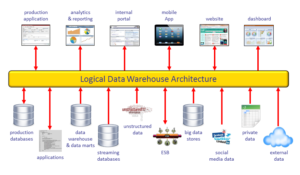 The architecture that fulfills all these needs is called the logical data warehouse architecture. This architecture, introduced by Gartner, is based on a decoupling of reporting and analyses on the one hand, and data sources on the other hand. The technology to create a logical data warehouse is available, and many organizations have already successfully completed the migration; a migration that is based on a step-by-step process and not on full rip-and-replace approach. In this practical course, the architecture is explained and products will be discussed. It discusses how organizations can migrate their existing architecture to this new one. Tips and design guidelines are given to help make this migration as efficient as possible. What are the practical benefits of the logical data warehouse architecture and what are the differences with the classical architecture. How can organizations successfully migrate to this flexible logical data warehouse architecture, step-by-step? Understand the possibilities and limitations of the various available products. How do data virtualization products work? Discover how big data can be added transparently to the existing BI environment? Understand how self-service BI can be integrated with the classical forms of BI? Learn how users can be granted access to 100% up-to-date data without disrupting the operational systems? What are the real-life experiences of organizations that have already implemented a logical data warehouse? • Can a logical data warehouse really work without a physical data warehouse? • Which virtual tables should be cached? • How can SQL-on-Hadoop engines speed up query performance? Physical Data Lakes or Virtual Data Lakes? • What is a Data Lake? • Is developing a physical Data Lake realistic when working with Big Data? • Can the logical Data Warehouse and the virtual Data Lake be combined? • What exactly is Data Vault? • Which new development and design skills are important?